Central and Northern California are littered with top-notch rivers and streams stuffed with planted rainbow trout. Meanwhile, few can handle the pressure that Lassen County’s Hat Creek can. Hat is one of the state’s most consistent fisheries and has been for decades. This year, nevertheless, I was told that it was off to a slow start back in May. The traditional bi-weekly early season plants didn’t happen. Fortunately, weekly plants remained. Fish and Game was trucking in mostly half-pound rainbows. The traditional broodfish brookies hadn’t arrived yet. Located between popular tourist areas such as Burney Falls and Lassen National Park, Hat’s multiple campgrounds, day use areas and roadside pullouts get hammered daily, if not hourly. Even in mid-June hundreds, if not thousands, of anglers cast salmon eggs into the creek daily. This season has been no different. The stream hadn’t changed much in the last decade. All the same popular spots that I fished back when I was in college remained. On thing did change, though. Last time I fished (and before I worked for Pautzke) everyone used Green Label salmon eggs. The past two years, that’s changed. 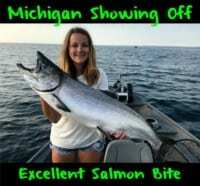 The new go-to bait has become Pautzke Gold Label salmon eggs. Gold Label has become a staple in Colorado and the Eastern Sierra, but it has just recently exploded in Northern California. After fishing the Sacramento River with pro Mike Bogue in the morning we didn’t even make it to Hat until after 4 p.m. Regardless, Gold Label allowed each of us to catch and release a limit of rainbows within an hour. We fished about 100 yards downstream of Rim Rock Ranch Resort. In fact, the dozen fish we caught were plucked out of a 50-yard stretch. When rigged up properly, a limit of bows on salmon eggs at Hat Creek isn’t a chore. On the other hand, Hat can be intimidating for first timers. Hat has a lot of volume and current and requires a lot of weight to fish it effectively. Oftentimes, the larger rainbows are in the deeper pools protected by swift water. Getting your bait down to the bottom in these areas and underneath overhanging banks is the key to success. While many anglers are successful pitching Gold Label eggs on treble hooks, I prefer single salmon egg hooks. Sure, I use two eggs every time, but one is to smash the egg and add scent to the hook, whereas the other is best kept in its natural state. Targeting Hat isn’t rocket science. Most of the fishing pressure occurs in popular campgrounds, picnic areas and day use areas. These are definitely the most heavily stocked sections of the creek, but keep in mind, fish do migrate from these areas, too. Not surprisingly, good fishing comes to anglers willing to walk to less targeted areas and with the amount of public water available locating lesser fished water isn’t a daunting task. Hat Creek will be in prime from now through October. 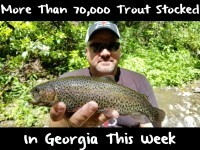 In fact, the creek gains trout weekly as Fish and Game starts making bi-weekly plants. 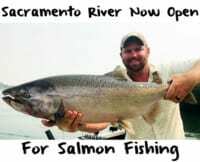 Head down to the river with four-pound test, or lighter, for this gin clear water, tie on a single salmon egg hook and grab a few Gold Label Balls O Fire eggs and you, too, will be catching limits in Hat Creek. Editor’s Note: Gold Label eggs are available streamside at Rim Rock Ranch Resort. Chris Shaffer is the Director of Operations at Pautzke Bait. He caught his first Hat Creek trout with his Uncle Ron here back in the early 80s.